Police were deployed across Harare after protesters blocked a number of roads. 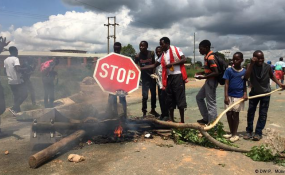 State security minister Owen Ncube has claimed that Monday's violent protests claimed lives as he blamed the opposition MDC party for what he described as "terrorism and total breakdown of rule of law and order." The MDC denied involvement in the demonstrations which were aimed at protesting against the fuel price hike announced by President Emmerson Mnangagwa on Saturday. MDC national spokesperson Jacob Mafume said the protest was publicly called by the Zimbabwe Congress of Trade Unions (ZCTU). "The protest was called by ZCTU and the citizens, our marches are clear and are called through a process," Mafume told NewZimbabwe.com. "This is a stay away that was publicly called." In a statement issued by his office Monday night, Minister Ncube people had been killed in the demonstrations which were largely concentrated in Harare and Bulawayo. He however, did not reveal the numbers of the fatalities. "(The protests) resulted in the loss of life and property, including injury to police officers and members of the public. We express our deepest condolences to the bereaving families. Full investigations are underway," the minister said. He blamed the MDC party and NGOs for the mayhem. "The prevailing security situation in the country is a culmination of a well-orchestrated series of events by the MDC Alliance working in cahoots with NGOs, civic society, youth organisations, pressure groups and individuals." He continued; "Government is aware of the identities of the ring leaders, their modus operandi and their funders, our security agents are now firmly on the ground, tracking the criminals they well be apprehended to face the full wrath of the law. "Now for the restoration of order and protection of life and properties the government has seen it fit to activate all its security organs government is appealing to members of the public to cooperate with the security institutions. "In the meantime security forces have arrested more than 200 individuals who were involved in these disturbances." According the Ncube, the protests were aimed at undermining President Mnangagwa's international re-engagement efforts. The Zimbabwean leader is currently in Russia for on a three-day state visit. From there, he is expected to travel to three other eastern European countries before attending the World Economic Forum in Switzerland. "They (protests) come against the background where His Excellency the President Cde Mnangagwa is out of the country and they are intended to undermine (kudira jecha) the ongoing re-engagement efforts of the President to market Zimbabwe at high level fora such as the World Economic Forum in Davos, Switzerland," said Ncube.